some of the links below require an ancestry.com subscription, try your library if you don't have a subscription. also the links to Family Search.com may not workFamily Search.com does not require a subscription. As I said above, George's parents were said to be Abram and Elizabeth Boyce Hixon, however, I believe that George's parents were Abner and Elizabeth, and not Abram. 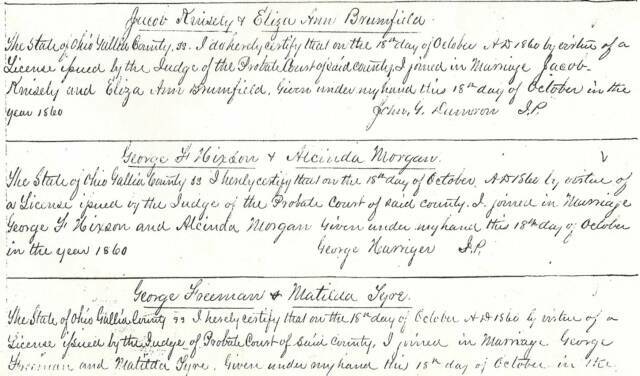 While Abram never shows up in any census in Ohio, Abner does show up in the 1820, 30 and 40 census in Harrison County, he shows up in the 1850 with a son George (age 13) and a wife M[artha]. What really lead me to believe this is our connection is a gravestone in Hanover Cemetery in Harrison County for "Elizabeth Hixon w/o Abner Hixson." The stone is apparently difficult to read as my contact sent that her vital statistics on the stone were "ag 51 yr, 5 mn, 7 dy. d 14 Aug 18-- OR 13 Dec 18-- By pure speculation I've concluded that she died between 1841-1848. My full theory is on my Abner Hixon page. George's wife Alcinda Morgan was born in Harrison County, Ohio. I love census takers that record not only the state, but the county of birth. According to the 1850 census 8 Alcinda was the daughter of John and Jemima [Merrell] Morgan. John was born in "Huntingdon County, PA," Jemima was born in "Monongalia County, VA," and all their children were listed as born in "Harrison County, OH." Abner moved to Carroll County sometime between the 1840 and 1850 census, and it is here in 1850 9 that his son George first appears, as anything more than a slash. George is shown to be 13 years old which would be correct since he was a December baby and hadn't celebrated his birthday yet. He disappears after the 1850 census, but does not show up in the 1860 (at least not that I've been able to find). However, he does show up in Gallia County on October 18, 1860, when he married Alcinda. George and Alcinda had 11 children, 10 which survived into adulthood, one daughter was born and died the same day. 1. The first child of George and Elizabeth was a daughter Elizabeth "Lizzie" who was born about 1863, and married an unknown Slagle (information provided by Linda Hoover). Further research, thanks to the internet, I have found a funeral home book 10 with Elizabeth in it. Surprisingly, she moved to California, and was apparently married to a Samuel D. Grant. I Googled Erickson & Brown (whose name appeared on the page) and got a funeral home in Taft, Kern County, California. I contacted them and received word that they are custodians of several earlier books, but that Book H is not one of theirs (as they didn't become Erickson & Brown until a short while later). What they did do for me though, and for which I'm terribly grateful, they copied the page and emailed it to me. Here is Elizabeth's Record of Funeral 11 information from the book. According to the Record of Funeral: Elizabeth Jane Grant, died October 5, 1934, and was born in Waterloo, Ohio. She was married and the wife of Samuel D. Grant. The funeral bill was to be sent to S.D. Grant & Bro., and the address is South Gate, Los Angeles (which will come into play in a minute here). Her place of death is listed as Res. G.P. Lease, Wheeler Ridge. [There's a Wheeler Ridge in Kern County, California]. The correspondent at Erickson & Brown believed that G.P. probably stood for General Petroleum, which is all leading us to the 1930 census, but bear with me a minute longer. She actually resided in the state 15 years, and at Wheeler Ridge 11 days. Her birthdate is given as March 5, 1865 and date of death as 69 years, 7 months, and 0 days. Her father is George F. Hixon, his birthplace Ohio, and the maiden name of her mother is [space] Morgan. Her birthplace is also listed as Ohio. She was interred at Evergreen M. Park. Was she ever married to a Slagle, did Mr. Slagle die and she remarried? My guess is yes, or at least she was married to someone prior to Samuel. Despite their ages being so off, I believe they are one in the same. Note that the funeral bill was to be sent to "S.D. Grant & Bro. of South Gate, L.A." and at the time of her death they were staying someplace that appears to have been connected with General Petroleum, and his business is an "Oil Supply Company" on the census. Too much of a coincidence in my opinion. And it's not the first time I've seen birth years off that much or more! Also note that her funeral record states she lived in the state for 15 years. So that would mean she moved there in or around 1919. Did she marry Mr. Grant before or after she moved to California? 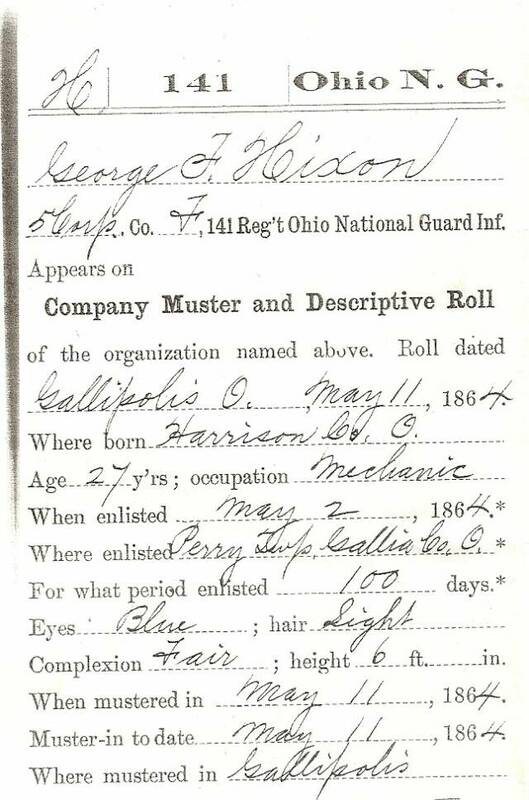 In 1864 George joined up with the Ohio National Guard (Company F, 141st Regiment, 100 days) He was described as being blue eyed, light hair, fair complexion, and 6 feet tall. He enlisted on May 2, 1864, and was mustered in on May 11. The regiment was mustered out on September 3, 1864. 13 He's listed on his military papers as a mechanic, and he was indeed a carpenter. George left home with a wife and daughter, and came home to a wife, daughter, and 2-month old son! 2. In late June 1864 Alcinda gave birth to a son Otto A/Albert O. who married Malinda Miller (daughter of John B. & Amanda Lee 14 ) on September 20, 1885. 15 While some Hixon researchers show both an Otto A and an Albert O, I firmly believe that they are the same child. 3. In 1868 Alcinda gave birth to John Morgan "Morgan" Hixon (named after Alcinda's father John Morgan of Huntingdon County, PA, and not General John Hunt Morgan, of Lexington, Kentucky). 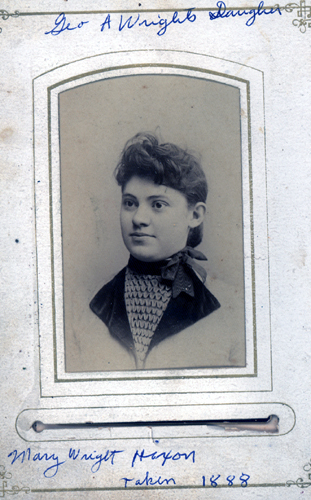 John married Mary E. Handley, October 19, 1887. 19 John died July 5, 1910 in Springfield Twp., Clark County, Ohio. 20 His father is listed as George and his mother as Margon (Morgan). Apparently the informant only knew George's wife as a Morgan. John's date of birth is given on his death certificate as August 14, 1865, he would have been born in Gallia County, Ohio. One interesting note, in the 1900 census 21 he's living with his brother William, in Scioto County and was listed as single. In the 22 (enumeration date was April) he's divorced living in a boarding house in Columbus where he's a plumber, and in July 1910 he died a widower in Springfield. I'm going to need to look into this in more detail. I wonder what happened to Mary? 4. The next child to come along was Homer born about November 1869. 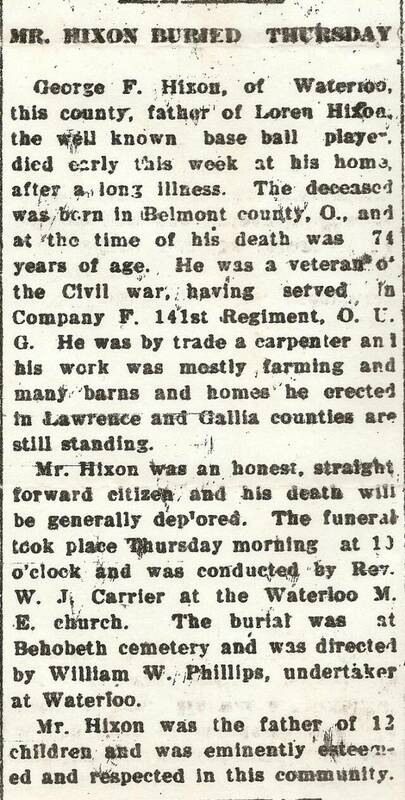 23 Some historians believe he died as a child, but I have a Homer Hixon who married Annie Eakman in Gallia County, on June 14, 1890. 24 And I have every reason to believe that this is George and Alcinda's son. According to the book So That Was Waterloo, "On September 1st, Waterloo area resident Homer Hixon died following a six week illness [location unknown]" 24A Unfortunately, it does not give a year, so that's all I have at this time. Update: Familysearch.org has a death certificate for Homer W Hixon of Waterloo that states he died Oct 8, 1892 in Walnut Twp., Gallia County and was 22 years of age. There is no image available, but I'll look into it. In the 1870 census, 25 George and family show up in Patriot, Walnut Twp., Gallia County, Ohio, as the "Mixon" family. He's a 32 year old white male. A carpenter by trade, no real estate, and $500 of personal property, and was born in Ohio. Alcinda was a 25 year old housekeeper, and was also born in Ohio. Their children, all too young to be in school, or have a job were "at home." Elizabeth was 7 years old, Otto A was 5, John M. was 2, and Homer W. was 8/12ths. 6. 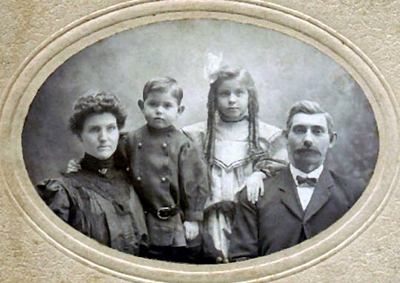 George's sixth child was Charles L. Hixon, who married Mary Wright on March 2, 1894. 34 According to his death certificate (transcriber error Charles S, should read Charles L) Charles was born May 5th, 1873, and died September 5, 1930, in Columbus, Franklin County, Ohio, where he had been a teacher. He was buried in Mt. Sterling, Ohio. All info gathered from death certificate. 35 In the 1900 census 35A he was living with his wife, Mary C, and their three children: Lillian M (b. June 1895), Bessie M (b. Oct. 1897), and Kenneth (b. Dec. 1899). 8. Hattie May Hixon was born June 9, 1877 in Perry Twp., Gallia County, Ohio. 41 Hattie married William Sherman Wright, about 1898/99. 41A Hattie passed away December 24, 1917, and was buried in London, Madison County, Ohio. 42 Her middle name of May comes from the 1900 census. The image above is of Hattie Hixon, William Elroy Wright, Bessie Mae Hixon, and William Sherman Wright. 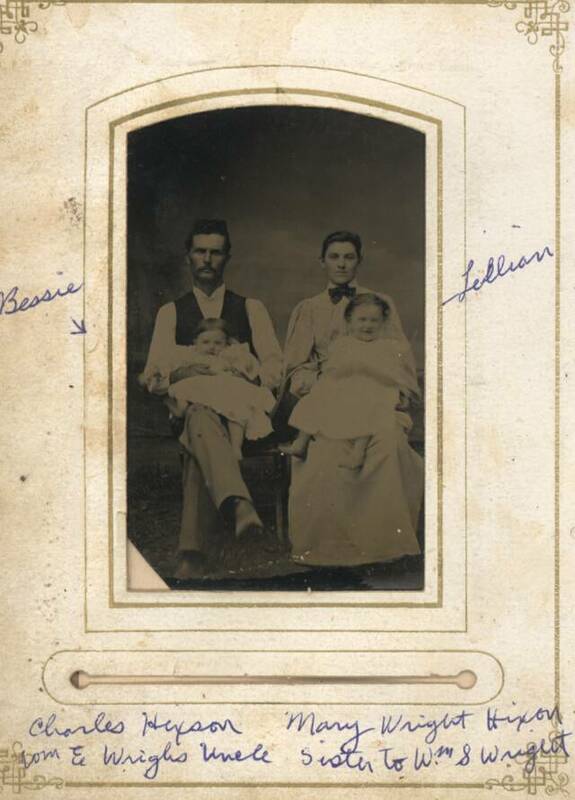 Bessie's parents were child #5 William O. Hixon and his wife Laura "Ella." Ella passed away when Bessie was about 18 months old, and her father gave her to Aunt Hattie to raise for him. Bessie is my grandmother. Original image is owned by Linda Trent. 9. Loren M. Hixon was born January 22, 1885. 44 Loren and George L. show up under their parents in the 1900 census, but unfortunately, the 1900 census is too light both on Ancestry.com and Heritage Quest even when going to the negative that little can be read of this family. They do not appear to be indexed on Heritage Quest and Ancestry.com has the family as George Wilson, Ale*Da Wilson, Lorain M. and E* Wilson. Someone put alternative names of George F. Hixon, Alcinda Hixon, Loren Hixon, and E* Hixon. When I look at the original on Ancestry.com 45 (the clearest copy) I easily see Hixon, George and the rest of the family Alcinda, Lorain (who is listed as a son so it would be Loren), and possibly Latrelle G.? Loren Marion Hixson died August 16, 1948 in Prairie Twp., Franklin County, Ohio. 46 By occupation he was a minor league baseball player and a school teacher. Most of Ohio's 1890 census was lost, including Lawrence County, so the next place we find George F. is in the 1890 Veterans' Census. 49 He's listed as Hixon, George F. Corporal Company F 141st O Inf. Enlisted the 2nd of May 1864, mustered out 2nd of September 1864, length of service 4 months. He lived in Waterloo and his complaints were disease of stomach, liver, heart, and eyes & piles. According to the book So That Was Waterloo, George and Alcinda "Cindy" were probably one of the first (if not the first) telephone switchboard operator in Waterloo about the turn of 20th century to about 1910. Mr. Null, (the author) quotes from a 1906 Ironton Register (newspaper) that "George F. Hixon is busy with his telephones." Mr. Null then comments that "George Hixon is the very first name encountered with Waterloo's new telephone system but it's doubtful that reference had been to line of phone installation. At that time, George and wife Alcinda 'Cindy' were in their early 60's with George's health only fair. More likely, both operated Waterloo's first switchboard." 50 George and Alcinda were no longer running the switchboard by 1910, Null suggests that George had to give it up due to failing eyesight. But whatever the reason by 1910 Ruth Vermillion is listed by occupation as "switch tender," in 1910. 51 George, Alcinda and Loren also appear on the 1910 census, the three of them residing in the same household. George was 73, Alcinda 67, and Loren 24 Neither George nor Alcinda are employed, and Loren, has his occupation listed as "base-ball player." But his fame in sports will be for another article. Alcinda followed 23 years later, on April 18, 1934. 55 She was survived by Elizabeth, William, LaTrelle, and Loren." Below are the footnotes to George F. Hixon. Some have a letter A after the number and that refers to the fact that I found that information and/or source "after" originally completing the footnotes, and since the footnotes don't automatically change, it would be more work to change each individually, so I numbered them the last number and added an A to indicated "added source since last update." The names at the end are the way they appear after being transcribed for ANCESTRY.COM (if it is mis-spelled or a letter off, it is a transcription error). 2. Tombstone just outside of Waterloo, Lawrence County, Ohio. 3. Muster and Descriptive Roll of the 141st ONG May 11, 1864. Gives age as 27. 8. 1850 census Ohio, Harrison, Monroe, District 72. Image number 25 of 28 John Morgan. 11. 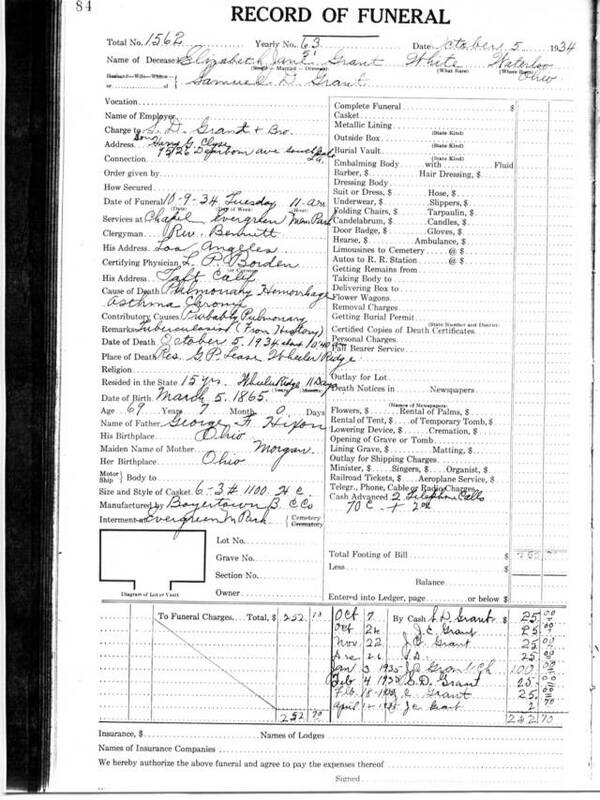 Record of Funeral, sent to me by Erickson & Brown. 16. 1870 census Ohio, Gallia, Walnut, PO Patriot. Image number 22 of 44 "Otto A. Mixon"
17. 1880 census Ohio, Gallia, Walnut, District 37. Image number 20 of 38 "Albert O. Hickson"
18. 1900 census Ohio, Scioto, Bloom, District 104, South Webster Village, Image number 29 of 45 "Albert O. Hickson"
21. 1900 census Ohio, Scioto, Bloom, District 104 South Webster Village Image Number 31 of 45. "William Hickson"
22. 1910 census Ohio, Franklin, Columbus Ward 7, District 108, Columbus City (part of) Image number 14 of 15 "John M. Hiten"
23. The 1870 census was enumerated in July 1870, and Homer's age is given as 8/12ths. Eight months from July would be November, 1869. 25. 1870 census Ohio, Gallia, Walnut, Patriot. Image number 22 of 44. "George F. Mixon"
27 and 27A and 28. Gallia County Birth Records (p. 1), Gallia County Birth Records (p.2) gives his month of birth as July. 32. 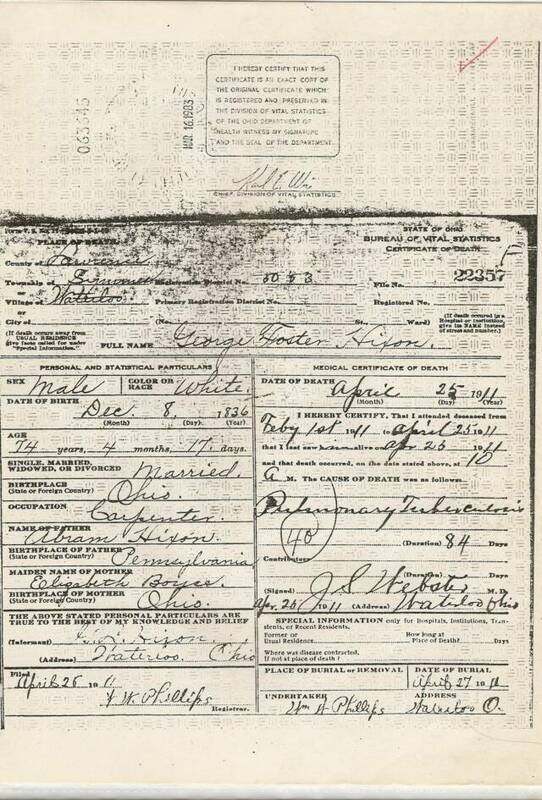 Charles W. Rice's Pension Papers gives Laura's Birth as the 5th. 33. Family Search.org Ohio Death Certificate "William O. Hixon"
35. Family Search.org Ohio Death Certificate "Charles S. Hixon"
35A. 1900 Census Ohio, Clark, Harmony, District 5 Image Number 9 of 38. "Charley L Hixon"
36. Lawrence County Death Records "Frank Arthur Hixon"
38. Family Search.org Ohio Death Certificate. "Verna Ellen Hixon"
39. 1900 census Ohio, Gallia, Greenfield, District 30 Image number 10 of 26. "Frank A. Hixon"
40. Lawrence County Death Records "Frank Arthur Hixon"
41A. 1900 Census Ohio, Clark, Harmony, District 5. Image Number 33 of 38. "Number of years married: 1"
42. Family Search.org Ohio Death Certificate. "Hattie M. Wright"
45. 1900 census, Ohio, Lawrence, Symmes, District 76 Image number 1 of 21. "Ale*Da Wilson"
46. Family Search.org Ohio Death Certificate "Loren Marion Hixson"
48. get George La Trelle's birth date source and put it here. 49. 1890 Veterans Schedules, Ohio, Lawrence, Symmes. Image number 4 of 5. 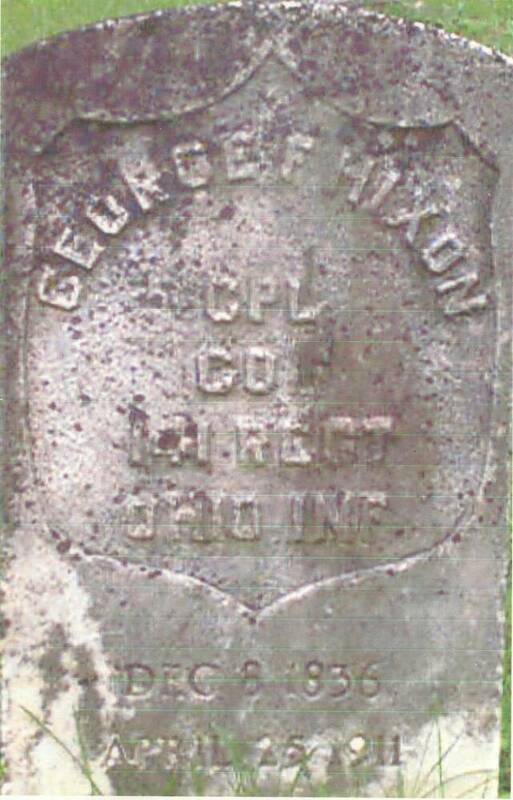 "George F. Hixon"
51. 1910 census, Ohio, Lawrence, Symmes, District 92 Image number 17 of 19. "Ruth Ann Vermillion" see also "George F. Hixon" on same page. 55. Family Search.org Ohio Death Certificate. "Alcinda Hixon"